Sakura is a fairly new Japanese restaurant in Astoria, opening its doors just last summer. 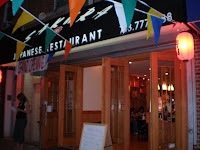 And given its rough location--just two short blocks from Watawa, Astoria's best sushi restaurant in my opinion--I have doubts about its long term survival. Eager to visit Sakura, I was curious to see how it stacked up against its tough-act-to-follow neighbor. As suspected, it didn't come close but despite this I'd be lying if I said the food wasn't decent. As every new restaurant in Astoria lately, this place put effort into its ambiance. The dining room is designed in a minimalist style--light wood paneling, simple white lanterns and ethnic Japanese art deck the walls. The whole space feels very airy and in fact, they open up the front of the house windows in the summer for a nice free-flow effect. My only complaint about the atmosphere is that they didn't have background music. I really feel that music sets the mood for a restaurant and the lack of tunes just fell flat for me. Sakura needs to work on this. We ordered edamame for an appetizer and scarfed it down. It's hard to mess up broiled soybeans but these really were very good--warm, salty and crunchy too. For my entree I went for the sushi of course. My roll of choice was the Green Dragon and I really cannot believe I got this adventurous--I usually order a boring California, Philadelphia or cucumber roll. 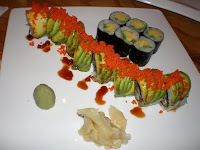 The Green Dragon--eel wrapped with avocado and topped with caviar--was a beautiful windy monster with a colorful shell. It almost looked too pretty to eat but I managed somehow. The eel tasted fresh and the nicely ripened avocado was sliced generously. A refreshing topping of caviar was lovely--with every bite, it felt like I was popping an infinite number of crunchy little juice balloons. It was yummy and legitimately fun to eat. I'd rate the service similarly to Leng Thai--efficient but sans personality. The language barrier was once again there and I felt uncomfortable asking questions. I received blank stares when I ordered just the appetizer so I basically kept things simple as to not screw up the order. The prices here are very reasonable. Sushi and sashimi range between $1.75-$3.50 per piece, rolls go for $3.50-$6.95 and specialty rolls range between $6.50-$11.95. Their lunch special includes various Bento boxes served with a choice of meat, shrimp or veggie; shumai, California roll, salad, soup & rice. Another lunch option is a roll combination--any two rolls for $6.50 or any three rolls for $9.50. I'd recommend this place for takeout. amazing take out...service is a bit hard with the language barrier, but delicious food. I heard of Tokyo 1 but haven't tried yet. I will make it my mission to get over there soon. Thanks for the tip.